The Uttar Pradesh State Rural Livelihood Mission (UPSRLM), Has Posted A Recruitment Notification For Various Posts (Level Wise Vacancies), So Like Always Eligible Candidates Can Apply For This Job Before The Last Date, 8th Of January, 2019. Please Do Check Out The Official Notification For Accurate Information, It's Given Below. BMMU Level (Various Posts) →1,553 Vacancies. 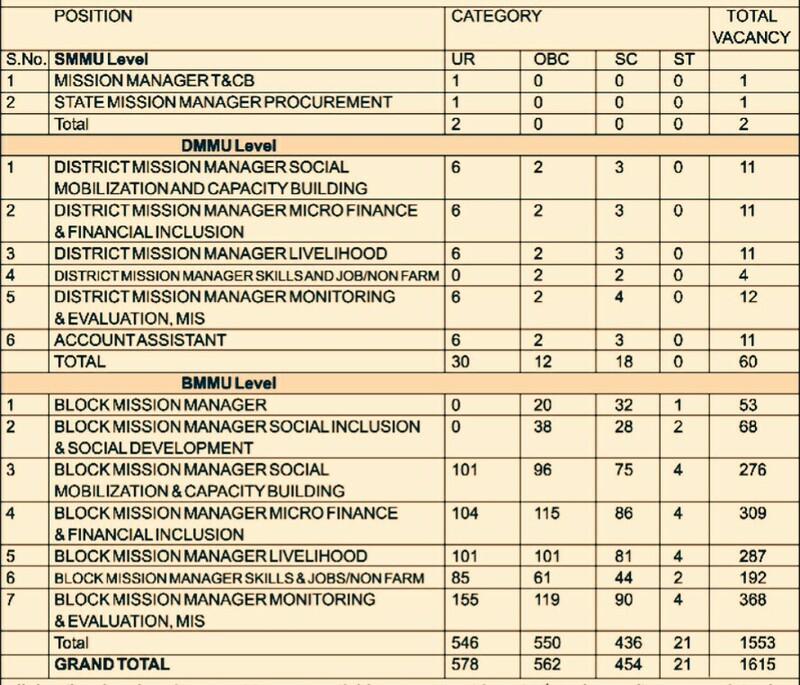 Total Number Of Vacancies →1,615 UPSRLM Online Vacancies. B. Eligible Criteria For Uttar Pradesh State Rural Livelihood Mission Recruitment 2019 Notification. Age Limit →40 Years For BMMU & DMMU Level & 55 Years For SMMU Level. Educational Qualifications →Post Graduate/CA/MBA Etc. Mode Of Examination/Selection Process →We Haven't Found Selection Process In Advertisement. Examination Date →For UPSRLM Exam Date, Please Do Regularly Check Their Official Website, The Link Is Pasted Below. Admit Card Download →To Get Or Check Out UPSRLM Admit Card Download, Click Below The Official Site. Result →For More Information On UPSRLM Result, Do Check Here The Official Website>The Official Website. All The Best And Do Visit Here For More Information On Jobs, Till Then Stay Safe And Blessed.